Whether you're trying to breathe new life into a dingy, stained ceiling or you want to add dimension to your room, painting the ceiling can be a bit tedious and messy. With a few tips and tricks, this step-by-step guide will help make your ceiling painting project go as quickly and painlessly as possible by teaching you how to prep, clean and paint. 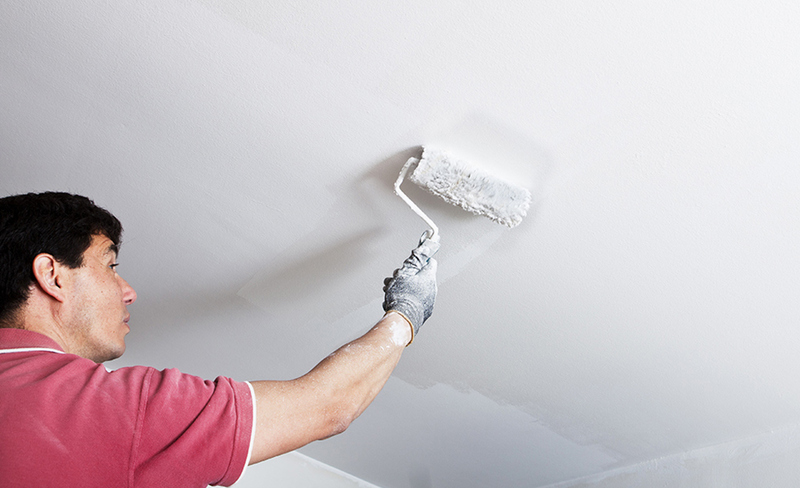 You want to make sure that any cracks or holes in the ceiling have been patched with spackle and repaired before you begin painting. Then, remove furniture from the room to avoid any splatter or damage from paint. Turn off power to the room by shutting off overhead fixtures at the breaker or fuse box. Remove or bag the ceiling fixtures. Removal of the ceiling fixtures will make for a neater job, but you can also drop the cover plates and wrap the fixtures in plastic bags. Set out all paint tools so that you have everything close at hand. Cover the floor by overlapping drop cloths by at least 12 inches. Protect windows, doors and trim if necessary. 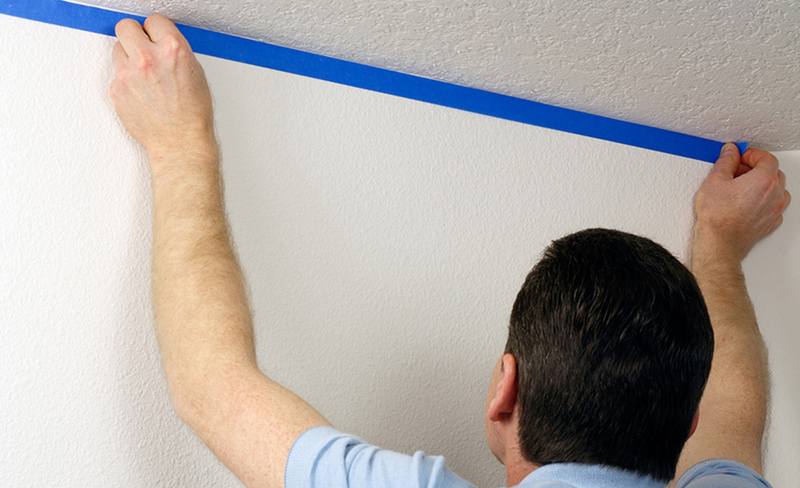 Mask off the tops of the walls with 2-inch blue painter's tape. 1-inch tape would allow the roller to strike the wall. 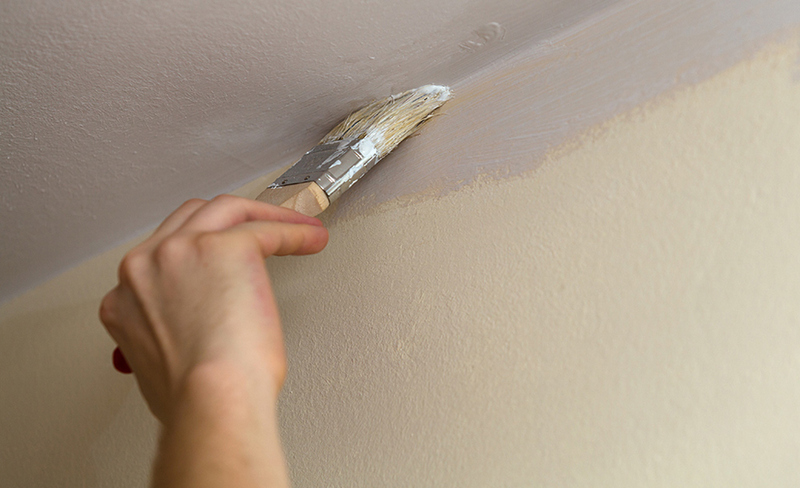 Before you begin rolling, cut in, or use your paint brush to paint the corners where the ceiling meets the wall. Doing this first will ensure you get the edges and will also allow the roller to cover any brush marks left behind, so the paint blends together better. Begin rolling over the still-wet cut-in strip. Keeping a wet edge prevents overlap marks on the finished ceiling. Load the roller regularly and roll slowly. Back-roll to blend the paint. Be sure to roll in one direction toward the opposite side of the room. Roll toward yourself but do not roll directly overhead and don't create a "W" pattern. Straight lines are best. The best way to paint a ceiling is to work in grid-like sections which helps keep edges wet and allows you to see your progress. Cut in with a pad or brush, apply paint with a roller and then roll out applied paint to blend the two areas. Slightly vary the direction of your rolling. Perfectly straight rolling is more likely to show overlap marks. Continue until the section is done. When you begin each section, start by cutting in the wall/ceiling joint. Continue applying paint, rolling out and blending with the cut-in edge and the previous section until the ceiling is complete. If you opted to paint your ceiling a brighter color, or simply feel that the white shade you chose could stand out more, a second coat may be needed. 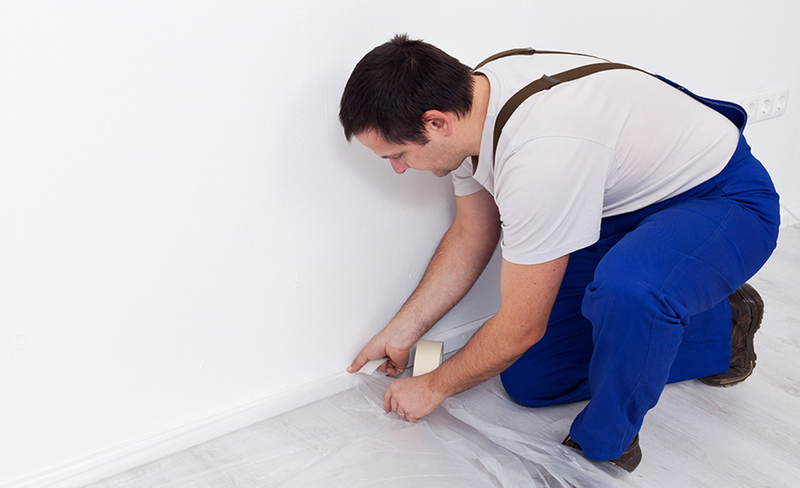 Apply the second coat in one direction, painting quickly until the entire surface is covered. Watch for drips and splatters. Wipe up immediately with a damp rag. Once all coats have been applied, begin cleaning up the room. Carry tools like paint rollers, brushes and paint trays to a garage sink or large tub to wash and set out to air dry. If you are painting an entire room from scratch, the ceiling should be the first thing you paint in the room. Invest in an extension pole. This will take a lot of the strain out of reaching above your head to paint, and will help you reach higher spots and angles easier. For textured ceilings, do a test roll to make sure texture doesn't fall off. 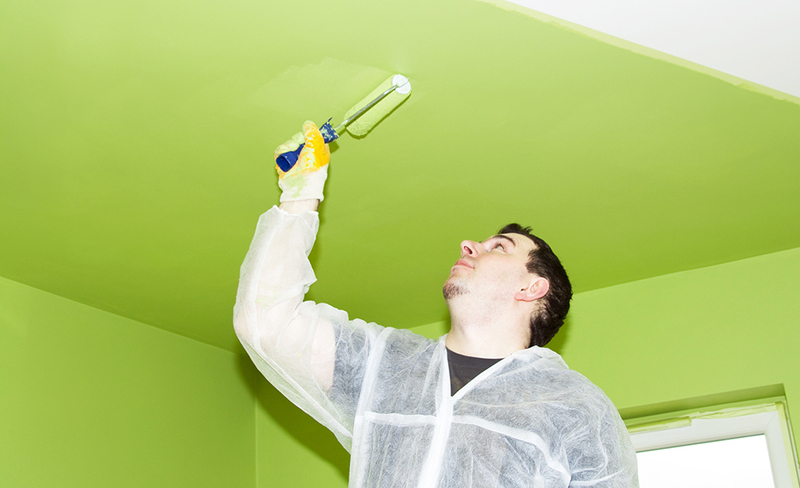 If texture seems loose, spraying the ceiling with paint may be your best option. The easiest way to paint a ceiling that's cathedral or higher is to invest in a good ladder that will support you. Always use ceiling paint as opposed to wall paint. Keep in mind ceiling paint comes in a variety of colors. We offer plenty of paint color ideas. Prep the ceiling before painting. Remove any dust or grime, as this can make it virtually impossible for paint to adhere. 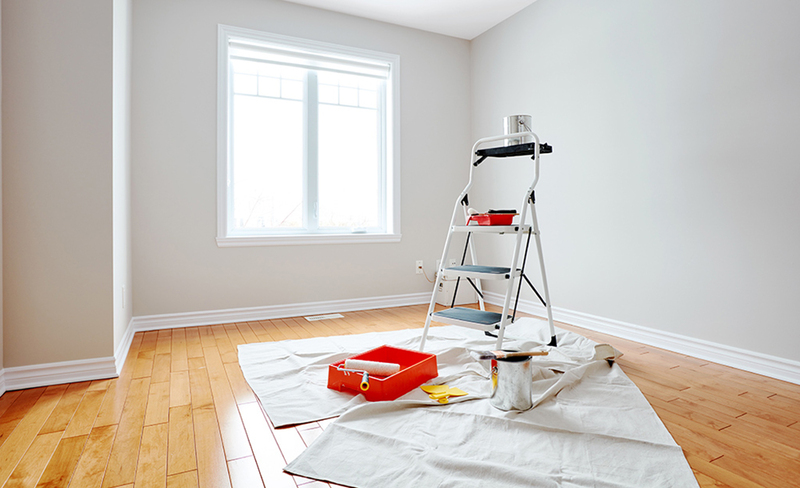 Mildew and water stains will bleed through even the best paint, so it may be necessary to use a stain-blocking primer before painting. Oil-based primers work best for water stains while shellac-based primers are more effective against smoke or nicotine stains. 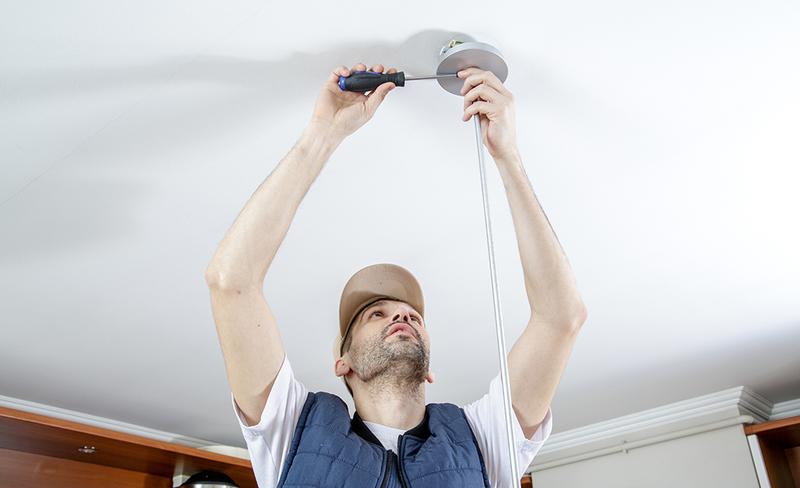 Finally, be aware of any cracks, marks or dents which may need to be smoothed out to prevent artificial light from being reflected off ceilings. Ready to have your ceiling painted but don't want to do the job yourself? Hire one of our certified professionals to get the job done.